After taking on the Dandenongs during our first day in Melbourne, we explored a very different side of Melbourne – the Mornington Peninsula. Located about an hour’s drive away from Melbourne, the Mornington Peninsula hosts a collection of popular natural attractions with a variety of beaches both sheltered and open-sea and many scenic sights and views. It is also famous for its wineries and vineyards and tourist attractions e.g. the Ashcombe Lavender Maze and the Strawberry Farm. The best part is all these are just minutes away from each other so you can check out the beautiful coastline, have lunch at one of the vineyards, get lost in a maze and still have time to pick your own strawberries! 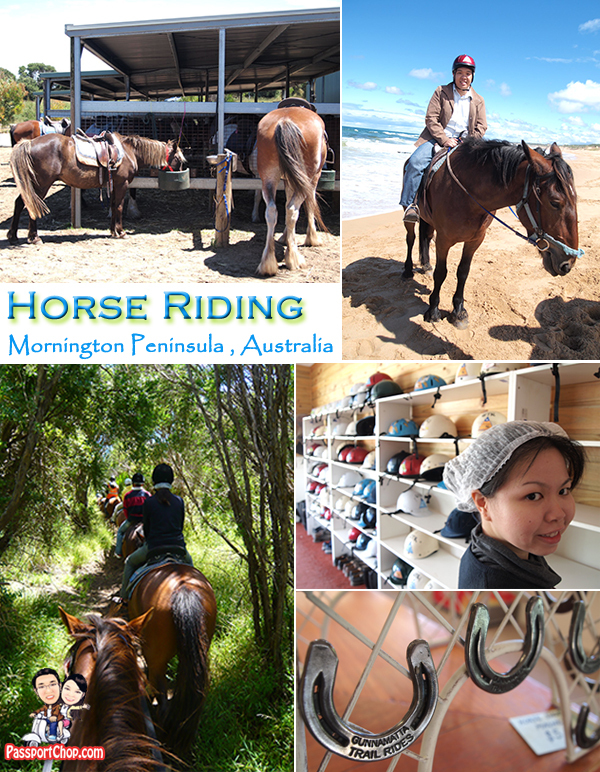 And we did just that in a day with Bunyip Tours with an additional horseback riding experience in the morning. Bunyip Tours’ Horse Riding & Ultimate Tour cost AUD$199. The first part of the tour comprises of a Bush and Beach Horse Riding Tour in the morning – the Bush refers to the native bush which we rode through en route to St. Andrew’s Ocean Beach. The Beach refers to the sand dunes, stunning stretches of beaches and pristine coastline after bashing through the thick bush foliage. This tour is suitable for both beginners and advanced riders – this is the first time that we had rode a horse and while we felt sore after the 2 hours of horseback riding, we felt safe and excited about the whole experience. All necessary equipment are provided by Gunnamatta Trail Rides – they have helmets of all sizes and hairnets are even provided for hygiene purposes. No backpacks are allowed and riders are required to keep their cameras and any loose-hanging items in waistbags (which are also provided). Sunscreen lotion is also available for free. Check out PassportChop.com Facebook page for more photos of this Bush and Beach Horse-Riding Adventure. Depending on your weight and horse-riding experience, the Gunnamatta Trail Rides staff will identify a horse that can carry you for the entire journey – mine was a 2-year old (which is about 13 years old in human age) horse called Theo. We travelled in a group of 7 with 2 Gunnamatta Trail Rides guides and we were taught basic non-verbal commands which we can use on the horse e.g. to steer left or right, just move the reins to the intended direction, as well as tips to keep our horse on the move. During the “Bush” part of the ride, with thick foliage and grass everywhere, it is very tempting for the horse to grab a quick bite on the road, especially so when the group stopped and it had nothing better to do but eat the bush around it. This is a no-no as the horse will keep on eating and overeat (since it had been fed in the morning) – thus it is important to rein your horse in (pulling up your reins – don’t let the head go down to grab a bite) everytime it attempts to snack. This is perhaps the toughest part and will require quite a bit of strength and the most frustrating thing is this happens every few minutes. Another point to note for the “Bush” part of the trail is to look out for branches, when you are trotting, sometimes its hard to avoid the branches overhead in time and thankfully, this is where the helmet comes in handy. The ride along the bushland track which leads to the ocean beach lasted for about 45 minutes. The group then climb over lofty sand dunes and down onto a beautiful sandy beach where the horses will walk in the rock protected ocean water. The ride along the beach can get quite cold due to the wind but compared to the “Bush” trail, the “Beach” trail is much more comfortable. This is also the part where there are photography opportunities but riders are not allowed to get off. The guides will take pictures for you with your cameras. 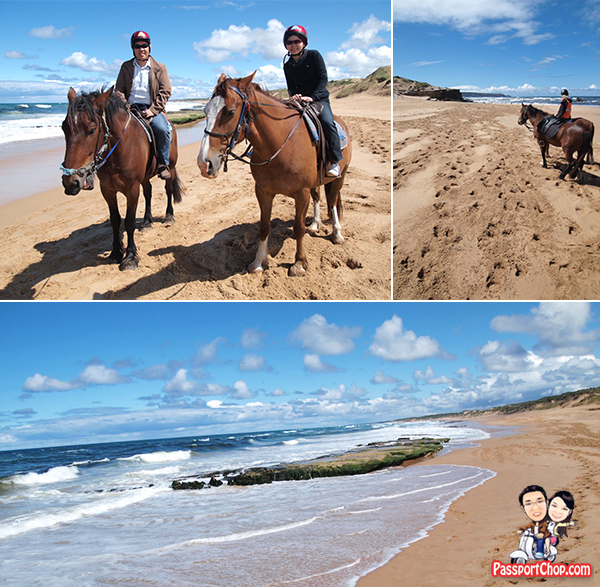 After a quick stop for photos along the Gunnamatta Beach, we ride back along the bushes back to the Gunnamatta Trail Rides stable where we waited for our pick-up to the next part of the tour. Besides the St Andrew’s Beach and Bush ride (which cost AUD$98 per rider for direct bookings with them), there are also rides with varying difficulty – from the very safe Walk-only rides to Full Day Rides. 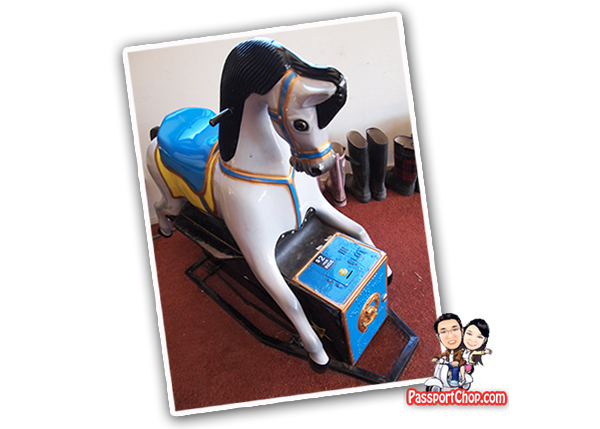 There are pony rides around the stables for AUD$20 for kids and if that is still too scary, there is always the safe coin-operated mechanical horse for AUD$2 – perfect for Family Holidays at the Mornington Peninsula. The next part of the tour is lunch at Mantons Creek Vineyard – a 19-hectare property which produces some of the best wine in the Mornington area. Interestingly, there is a dog called Hero who is the star attraction of Mantons Creek – it is one of the most active dog I have ever seen, always ready to go and play fetch enthusiastically with the guests of Mantons Creek. Just pick up a stick and you will get his full attention, standing by til the moment you throw it and you can be sure that Hero will get it back for you within seconds. 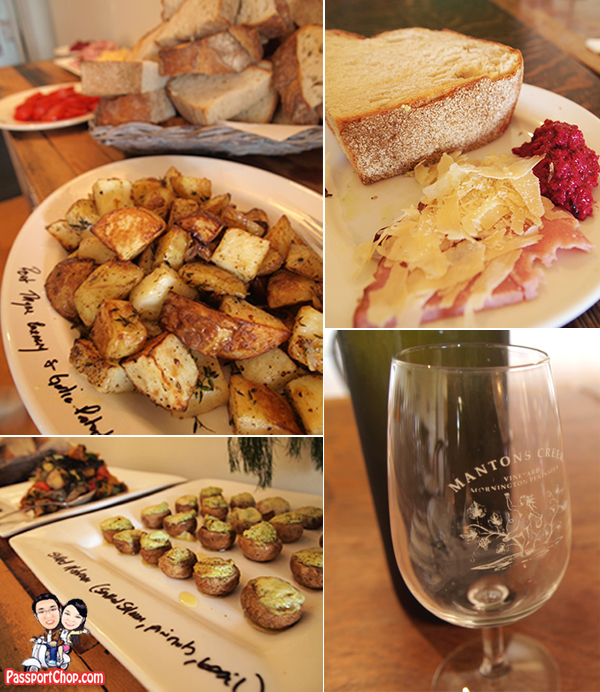 We were here at Mantons Creek Vineyard for the healthy organic lunch and there was a wide spread of yummy dishes from the Garlic Potato cooked with Thyme Rosemary and Stuffed Mushroom cooked with Smoked Salmon. Even the bread spread – the Roasted Beet Root Dip is one of the best I ever had. This meal is then complemented with a glass of Mantons Creek white wine. There would be more food coming up during the second part of this tour, which we really looked forward to – ice-creams (of Lavender and Strawberry flavors)! wahhh..u get 2 ride horses & eat yummilicious-looking food! Wow..these photos are really encouraging and inspirational for horse riding. To go for slow horse riding in a jungle is really exciting, as I did before. wow it seems like you had a REALLY good time. I’m kind of jealous haha, just kiddin’. There may be not a day which i failed to go to your blog, it is just so enjoyable and uplifting to be around day in reading your opinions and your writings. Continue posting you have me hook my pal. I wish I thought of this first. hoping 1 of this day of my life, i can go there also.